Design a Better Business is the result of a hunderd-day-race of Patrick van der Pijl from Business Models Inc, Justin Lokitz from Business Models San Francisco and Lisa Kay Solomon co-author of the bestseller Moments of Impact. Designers Maarten van Lieshout and Erik van der Pluijm completed the Design a Better Business (book)team. 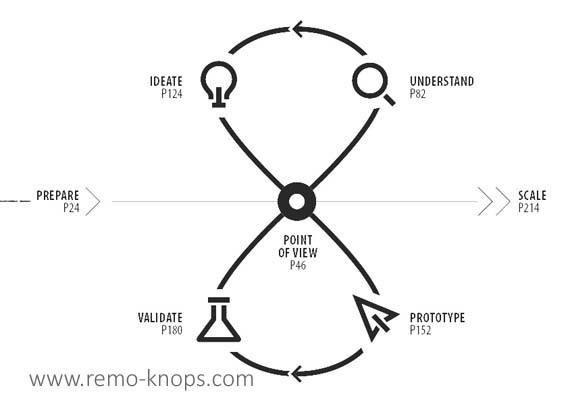 Based on the design thinking model (double loop) various must-have tools, skills and case studies are discussed for each phase in the model. So let’s dive into the book structure first and see if the highly visual work book consumes as easy as the Business Model Generation Handbook. The complete breakdown of the structure of the book can be found on the Wiley Bookshelf page of Design a Better Business. The double loop model, is the umbrella of the book. The first chapter of the book explains the the details of the double loop design journey. It is not a difficult umbrella to understand, and the authors amend a great level of detail and knowledge in each of the chapters of the book. So let’s have a look at the structure of the “prepare” chapter as an example. The sections of the chapter consist of drawings that help you quickly consume the contents, while expert tips provide some interesting practical examples or insights that help you better understand the theory discussed. At the end of each chapter there is a summary of the knowledge that you’ve build, a recap of the chapter and the next steps. This similar structure for each chapter makes the Design a Better Business book easy to navigate. In other words, the chapter structure is predictable (the contents is not). Design a better business is not just the title of book. Patrick van der Pijl and his team have created an online library with the various tools discussed in the book. Best of all the tools are free to use. Again all the tools are structured in the different phases of the double loop model, as you can see in the picture above. Some of the tools are still under development, but the vast majority of tools is there. If you click on a single tool, you will find a tool specific page (for example warroom check list) where you can download for example a canvas and you can read the instructions on how to use the canvas in a workshop setting. 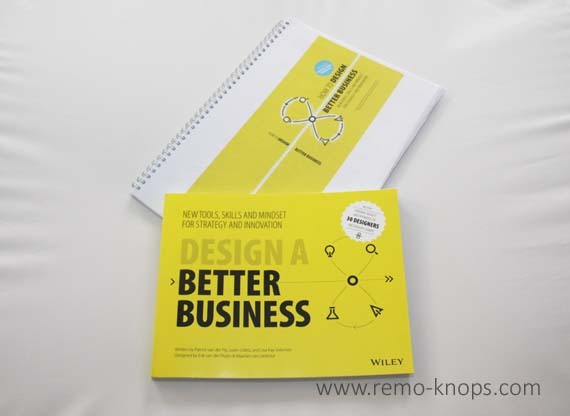 Design a Better business is an excellent workbook for entrepreneurs, corporate entrepreneurs, innovators, business analysts and many more professionals. It is not the type of book that you will read from A to Z, but like a good work book, you will understand the overall structure and deep dive into the parts that you really need for your specific problem. It’s like knowing the structure of a Chinese menu and ordering the different courses you like. The highly visual design helps you to easily consume the content, while the umbrella of the double loop design thinking model helps you to easily zoom-in and zoom-out of certain chapters. Each book chapter has a comparable structure, that starts with and overview and ends with a summary, recap and next steps. You can see a similar design DNA as the highly successful Business Model Generation handbook, despite the fact that the book team and the book designers were different. Perhaps surprising is that the book mainly focuses on tools and skills, not on theory. Through-out the different phases of the double loop model more than 20 tools are shared, while 7 core competencies required to design a better business are highlighted as well. 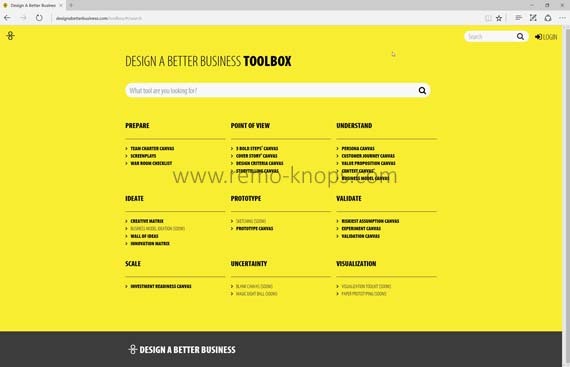 The extension with the Design a Better Business Toolbox on their website perfectly makes sense. One central library with the latest versions of professional tools used in the field. 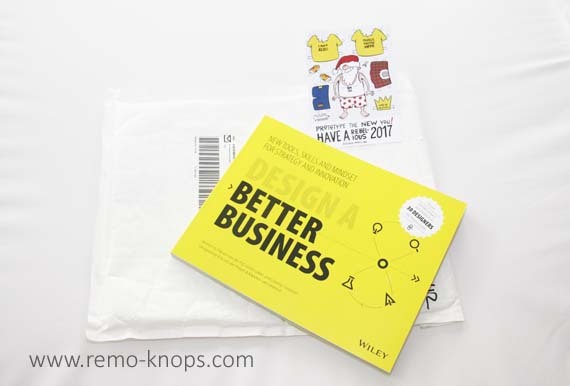 Design a Better Business can be ordered through Amazon or Barnes & Noble for the price-point of about € 20,00. When you are interested in business model innovation and business design, this is a must have book for your book shelve, given the quality, price point and available online resources. I’ve also seen the double loop / double helix model in a Supply Chain design context, which according to Professor Staffan Gullander is an underrated activity in Business Development !